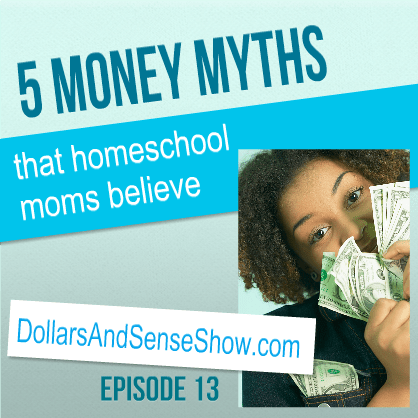 In this episode of the Dollars and Sense Show host Carol Topp and her guest Susan Raber of AtHomeAndSchool.com discuss money myths that homeschool moms believe. Do any of you, like me, have curriculum sitting on your shelf, that, if you are honest with yourself, you will probably never use? I personally do not look at the Sunday sale ads. I didn’t know I needed stuff until I saw the ads! So I stopped looking. Maybe it’s the same with you. What are your contentment robbers? Use a shopping list at curriculum fairs. If it’s not on the list, you don’t need it. Myth # 2: I Need …..
Do you think that you just have to have a certain item (whether you need it or not) just because another homeschooler has it? Myth # 3: It was on sale; I saved a lot of money! Truth: Money is not saved unless there is a deposit into the bank! As yourself: Is the sale price a good value? My daughter was looking at an audio book catalog with deeply discounted prices. “How can they sell these audio books so cheaply?” she asked me. “The original price was $500 and they’ll sell it for $150.” Perhaps, it never sold at $500 and it’s only worth $150. Is the $150 a good value? Tip: If you buy something on sale, put the difference in a savings account. Use the savings for future homeschool needs. Tune in for the next Dollars and Sense show on April 10, 2014 when Carol and Susan will discuss More Money Myths that Homeschool Moms Believe.